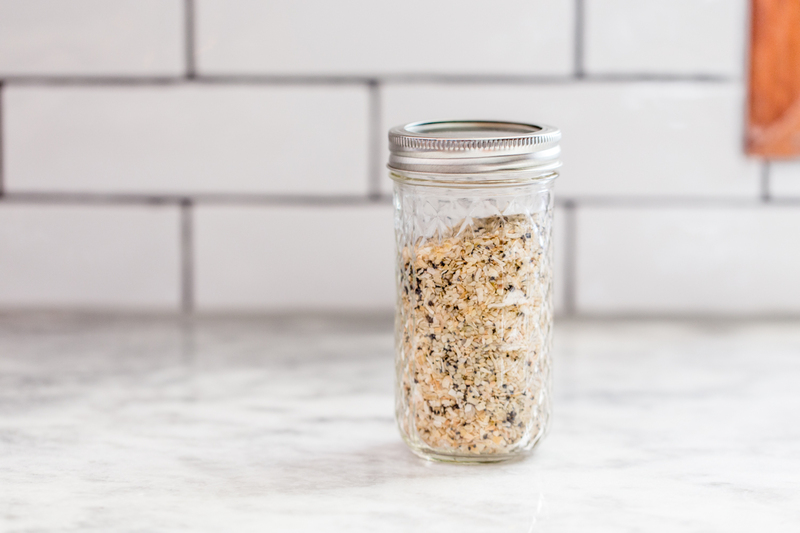 Make a jar of homemade everything bagel seasoning to turn up the flavor of eggs, avocado, toast, and more. Sprinkle it on just about anything! Before we get to the big news, let’s talk everything bagels. They are hands down my favorite kind of bagel. When I was in college and working at a local flower shop, I would stop by Tim Hortons and order a toasted everything bagel smeared with strawberry cream cheese every time I went out on flower deliveries. It was my weird little ritual that fueled my delivery rides. I don’t know why an everything bagel with strawberry cream cheese was my bagel/cream cheese combo of choice, but it just tasted so good! The sweet and the salty together was incredible. It turns out that my favorite part of that was the seasoning on top of the everything bagel. It was salty, garlic, onion-y, and provided an amazing crunch to the soft bagel. But recently, I have shifted my way of eating and for the last 9 months I have been eating a ketogenic diet. If you aren’t familiar with the ketogenic diet or keto, it’s a way of eating that drastically reduces carbohydrates and eliminates sugar in place of eating high fat foods and moderate protein. By eating in this manner, your body shifts from a sugar burning state to a fat burning state and helps regulate blood sugar and promotes weight loss. My reasons for transitioning to a keto lifestyle were due to medical concerns including being pre-diabetic and needing to make a change in my way of eating. I started a new/second food blog called Emily Goes Keto! This is my new blog where I will be sharing all of my keto recipes for real life as well as all of the tips and tricks I have learned over the last year. It’s hard to believe that I have been blogging at Jelly Toast for over 5 years. A lot has changed in that time. My kids are growing like weeds, I turned 35 last summer, and my body has been screaming for me to listen to what it needs. And to what it doesn’t need. What does this mean for Jelly Toast? Well, Jelly Toast will be mainly unchanged. I will still be sharing all of the non-keto recipes that my family enjoys. While my family has embraced some keto ways of eating, they are by no means fully keto. They love whole grains, starchy veggies, and the occasional sweet treat. These are the recipes that will continue to show up here on Jelly Toast. But I will also be sharing more DIY, craft, and lifestyle posts which I am SO excited to share! Eating this way for the last almost year, it’s been a struggle to not talk about it here on Jelly Toast. Keto is such an important change that I was making that I really didn’t want to talk about it too soon for fear that I would give up. I knew this time was too important to not follow through with some eating changes that my body needed. 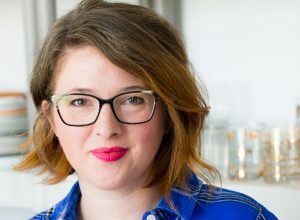 That is why I am so excited to finally be sharing my keto recipes on Emily Goes Keto while keeping Jelly Toast what it is but adding more great lifestyle and DIY content. If you are interested in a keto diet or learning more about why I have transitioned to a keto lifestyle, be sure to check out my about page and my first post, welcome to Emily Goes Keto! Be sure to subscribe to my Emily Goes Keto newsletter if want to receive new keto recipes by email. 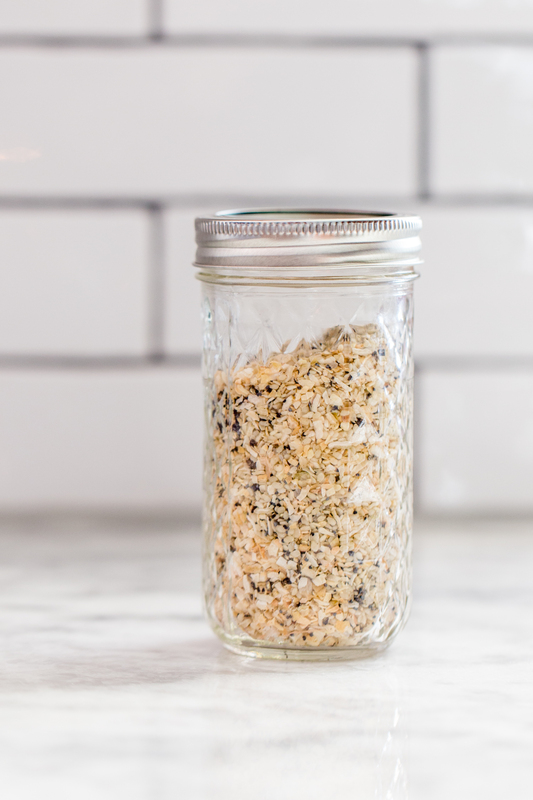 I am sharing my first keto recipe today on Emily Goes Keto, which is tied to this amazing homemade everything bagel seasoning: Everything Bagel Deviled Eggs! 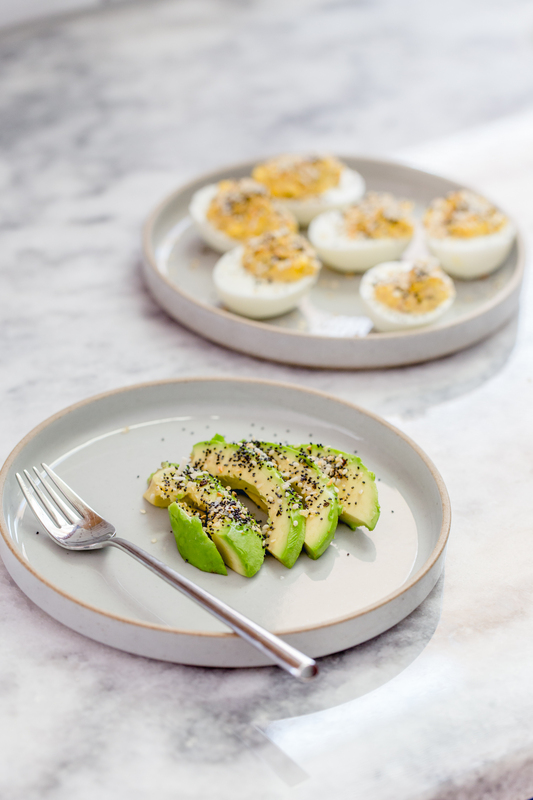 These eggs are the perfect keto breakfast or lunch. Quick, easy, and full of all that great everything bagel goodness! Totally simple and involves no cooking whatsoever! I have been keeping a big jar of this seasoning in the cabinet to sprinkle on fried egg toast, deviled eggs, avocado, and more. Now I can make any keto-friendly food taste like my favorite bagel flavor, which means I’m living my best life, guys. Thank you for being so supportive over these last 5 years. I look forward to sharing many more with you! Add all ingredients to a mason jar and place on lid. 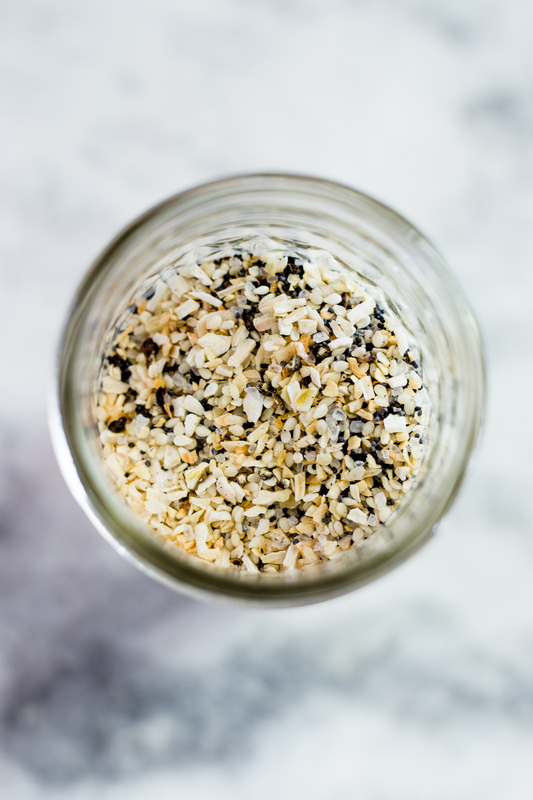 Shake and roll jar until all ingredients are mixed. Sprinkle on all of your favorite foods and enjoy! This is awesome! Sprinkled on avocado looks amazing. Why is the Everything bagel such a magical creation!? Thanks for sharing!